Swedish Azz is a tribute to two exceptional figures in the history of Swedish jazz, baritone saxophonist Lars Gullin and pianist Lars Werner. The first of these was profiled in prestigious American magazine Down Beat in 1954, which regarded him as the most interesting new jazz artist even though he had never crossed the Atlantic. Initially fascinated by the cool jazz school, he is chiefly remembered as a talented soloist whose melodies were heavily influenced by Swedish folk music. Pianist Lars Werner, whose inclinations were of a much more avant-garde nature, abandoned the saxophone under the inspiration of such musicians as Lennie Tristano, Bud Powell and Henri Renaud. He was a person who was unusually open-minded with regard to art. He combined various aspects such as performance, poetry and music into an integrated whole, which lent his performances a dimension that was more reminiscent of a theatrical production than a concert. 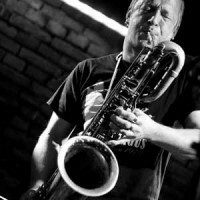 Mats Gustafsson is a saxophone titan, but is most closely associated with the baritone saxophone, which he doesn’t go anywhere without. Merely writing about how impressive his current discography is would by no means do him proper justice. He possesses one of those rare styles that is recognizable after just a few seconds. It is difficult to detect any melodies in his playing. Gustafsson’s sound is a phenomenon so radical that I imagine that Jack the Ripper would play just like this if he was a musician. Encountering Per-Ǻke Holmlanderem presents one of the few opportunities – let’s be honest – to hear the tuba, and he is a master of this instrument. When he shares a stage with Gustafsson, there is a real clash, because they represent completely different sound production philosophies. In contrast to the saxophonist, he actually specializes in extremely subtle vocalizations, wheezing and growls which can only really be appreciated when he is playing solo. The percussionist Erik Carlsson is notable for his diverse approach. He is inspired by both acoustic and electronic soundscapes and attempts to explore both fields with equal tenacity. 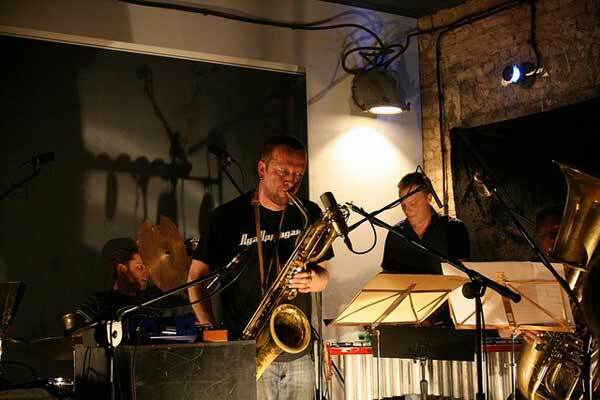 He makes fluid transitions from jazz-influenced polyrhythms to sonoristic experiments reminiscent of the accomplishments of composers of contemporary music. His milestone recordings were made with the Skogen group. DJ Dieter Kovacic, aka dieb13 emerged from the Austrian experimental electronica scene. In fact he has nothing in common with jazz, which can only serve to spice up this collaboration with a little exotica and potentially open up completely new possibilities. The vibraphone player (Kjell Nordeson) is not coming because of medical reasons.